Google self-driving car prototypes: Why you won’t see them on your street anytime soon. Google’s Fully Driverless Cars Are Ready for the Road. Well, Some Roads. 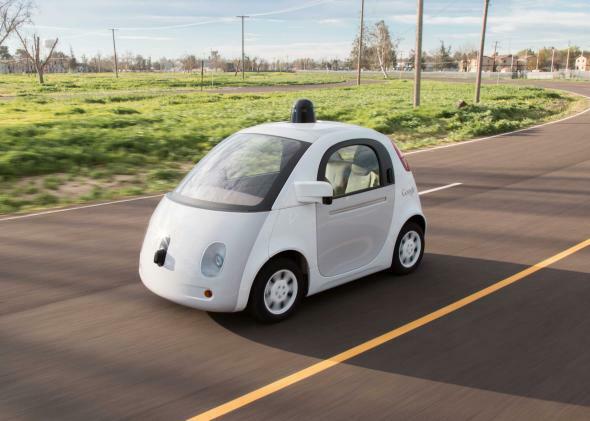 Google’s self-driving car prototypes don’t require human drivers—but California law does. Google has been testing self-driving car technology on American roads for six years now, with mostly encouraging results. Until now, however, it has used specially outfitted versions of mass-production cars like the Toyota Prius and Lexus RX 450h. On Friday, the company announced that it is ready to put its own custom-built, fully self-driving cars on public streets for the first time. Yes, those cute little Koala-mobiles are apparently road-ready, just a year after Google introduced them to the world. They’ll start out by tooling around the intimately familiar Mountain View, California, roadways that Google’s self-driving Lexuses have been cruising—and painstakingly mapping—for the past couple of years. Google’s prototypes are designed to be not just self-driving, but fully driverless: They have no steering wheels, brakes, or gas pedals, just buttons you push to start the ride. As you can see in the video below, they’re designed to be capable of completing their journey without anyone in the driver’s seat at all. What’s interesting about all this is that Google doesn’t really believe that putting a human behind the wheel makes its self-driving cars safer. It’s happy to comply with California’s law for now, of course, while it’s still developing the technology and mapping the terrain. But in the long run the Googlers behind the self-driving car project are convinced that driving will be safer once humans are removed from the equation altogether. That’s a view not widely shared—or, at least, not widely voiced—among mainstream automakers, which is part of why Google had to build its own steering wheel–free prototypes in the first place. But at least a few manufacturers may be starting to come around: At the Consumer Electronics Show in Las Vegas in January, for instance, Mercedes rolled out a futuristic concept car in which four passengers face each other rather than the road ahead. Whether we’ll see anything like that on public streets in our lifetimes will depend in part on the success of the types of tests that Google is doing today. It certainly won’t happen anytime soon. One other thing that isn’t likely to happen anytime soon: Sighting a Google self-driving car prototype on a random street in Anytown, U.S.A. As the Atlantic’s Alexis Madrigal explained last year, near-perfect information about a given roadway has been crucial to self-driving cars’ success so far. Google has turned parts of Mountain View into a virtual test track by mapping literally every speed bump and stop sign. Google said in a statement Friday that it is starting to send some of its self-driving Lexuses into new territory, including San Francisco, where they’ll encounter fresh challenges like hills and fog. Until further notice, however, the driverless prototypes will stick to the cozy confines of Google’s hometown. Self-Driving Cars Are Getting Into Accidents. How Safe Are They, Really?